It has taken over 12 months, but we’ve finally signed a contract with a builder to renovate our bathroom and laundry! Woo hoo! 1 Is this an renovation for resale, or to suit your needs and tastes? We moved in over 2 years ago into a lovely old house and we knew right away the bathrooms were the least appealing areas. The areas are functional but still unusually designed and old (not classic, period-charm-type old, but that kinda dated old that resembled a public toilet). A cosmetic upgrade would be enough to improve resale value, but it wouldn’t allow us to maximise the use of our space so we have decided to change the layout. This involves moving plumbing and windows and means we could potentially overcapitalise on our spending if we were just renovating for sale. As we know we want to stay here for several years we are happy to spend more than required for just a basic facelift. We have then taken a lot of time measuring the room and researching the standard measurements and clearances required for doors, toilets, showers, baths, washers and dryers. We have done this so we have an idea of how much space everything requires before we started designing the new layout. This ensures we maximise the space available for how we would use it with our desired fixtures and fittings. I find this will always be one of the first things you need to consider because it drives so many other decisions. What we learnt from starting with full-service builders was that we could ask about: design ideas, high-end upgrades, low cost options and any areas where they might see challenges or a cost blow-out (e.g asbestos, poor access). 3 Do you want to manage the project yourself or have a builder to manage the whole process? My husband and I have never been handy which is why we started looking at builders who could do it all. However after the first few quotes, we thought about managing the project and trades ourselves on the assumption this could save us money. We then started looking into the specific trades required: plumbers, tilers, plasterers, electricians and cabinet-makers. We costed out the fittings and fixtures with a high-end and budget option. We found if we managed the project ourselves, without a doubt, even with high quality fittings, we would be saving approx 15%! How would insurance work if a tradesman got injured on our site? Scheduling the trades separately could mean the work drags out for weeks or even months (depending on their availability). This was a major consideration as we have two young kids. If there was a problem down the track we would need to contact each trade separately to negotiate a fix. I had heard horror stories from friend about how they found out about unsafe wiring and the electrician denied it, claiming the plasterer had damaged the work. In the end it took months to sort out the cause and have the problem fixed. After all the quotes and trips to Bunnings to ask their opinion in DIY, we decided to go with a full-service builder based on the points above. 12 months later we went back to one of the original builders that quoted, whom we knew had a good reputation and asked them to quote again. This time we had a better idea of design and costs which made it much easier to negotiate. Do your research online and talk to everyone – tradespeople are experts and are usually willing to share what they know and what they think will be easy and / or hard. This will help you gauge whether you can DIY. Remember, the staff at hardware stores can be amazing for advice as well! Give yourself plenty of time to research and make decisions. Especially if you have never done this before. Check tradespeople have current licenses for the work they are doing as well as ask for recent referrals. You can also contact Fair Trading NSW to see if they have any disputes against them. Thank you Jane* for your blog, some excellent points to consider when planning. We can’t wait to hear how your bathroom renovation proceeds and of course see the photos! Would you like to share your #realmumreno with us like Jane* has? 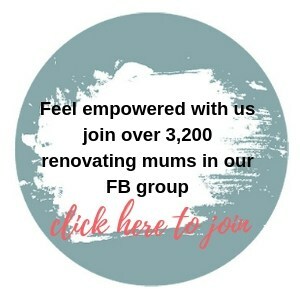 If you would like to feature as our next ‘Real Mum’, we would love to hear from you! Please contact us here.